If you’re looking for a locksmith in Hertford, you have come to the right place. With a team of experts and state of the art equipment, Access Denied is the locksmith in Hertford choice for many. We help homeowners, car owners and businesses whenever they run into a bit of bother with a key or a lock. All you need to do is get in touch with us, and we’ll be there in record time. At Access Denied, we take great pride in providing a high quality service at all times. We focus on professionalism, right from the first time you contact us through to the job being finished. This is what sets us apart from other similar companies. Though we don’t need to put such emphasis on ensuring our customers enjoy the time they spend with us, we do. It’s what sets us apart and allows us to go above and beyond what’s expected of a locksmith in Hertford. As a professional locksmith in Hertford, we’re able to provide a full service. This includes replacement locks, replacement keys, issuing spare keys, gaining access to cars and gaining access to properties. We’re even able to help out when a key snaps or a lock just isn’t working as well as it should. We know that even the smallest problems with a lock or key can become a nightmare if they’re not fixed, which is why we’re always available to help. Everyone at Access Denied is well aware of the stresses and strains that come with being locked out or being faced with a faulty lock, which is why we don’t hang around. From the moment you contact us, it’s full steam ahead until the problem is solved. Regardless of how difficult the job or how complex, you are guaranteed a fantastic service from beginning to end. If you’re in need of a locksmith in Hertford and you have a question, get in touch. A member of the Access Denied team is always on hand to help. Alternatively, browse our website and find the service you need. Being locked out of home, work or your car is never fun; it’s stressful, annoying and hugely delaying. That is why we work hard to help those who are locked out in Hertford. At Access Denied, we have a number of hugely talented locksmiths and this allows us to provide an unmatched service to those who are locked out. Whether you’re locked out of home or you need help getting into your car, we’re only moments away. There are a number of reasons as to why you have ended up locked out; one of the most common is that you’ve headed out of the front door and simply forgot to pick up your keys. However, children are also to blame relatively often and so is losing keys. Whatever the reason, Access Denied can help. Rather than worrying about what to do and contemplating the worst, get in touch with us. Through our years of experience and great deal of knowledge, we’re able to provide an unmatched service to all of our clients. This includes fantastic customer service, a professional service and the ability to be there quickly. After all, you won’t want to be waiting around when you’re locked out and have things to do. However, this focus on service doesn’t take away from the quality of the work. We use state of the art equipment and modern techniques, all of which help us to gain access to properties and cars without causing any lasting damage. This is why we don’t ever recommend trying to do so yourself, as there’s a risk of further damage being and this can be costly. Instead, leave it to the professionals. One of the great things about the team here at Access Denied is that we’re completely mobile, which means you don’t need to worry about coming to us. So, if you’re in a supermarket car park and you’re locked out, you can stay there until we turn up. Similarly, if you’re locked out of home there’s no need to travel anywhere else. If you’re locked out and need assistance, get in touch with Access Denied. You may not have considered the importance of lock replacement in Hertford as a service. Most people think of locksmiths and assume we focus on replacing lost keys, gaining access when someone is locked out and issuing replacement keys. Though this is true to some extent, we do also offer lock replacement services. As with all of the Access Denied services, our lock replacements are high quality and professionally done every time. There are a number of reasons as to why you may need a lock replacement. For example, you may have recently moved house and require brand new locks. Another reason is that you have lost a key and want new locks to ensure safety or maybe you simply want an upgrade. After all, older locks are rarely as secure and durable as newer locks. Luckily, regardless of the reasons for wanting a lock replacement in Hertford, Access Denied can help. At Access Denied, we focus on providing a professional service at all times. Within that, we focus on efficiency and effectiveness. This means that we work hard, we work quickly and we use the techniques that will do the best job. Think about it, nobody wants a lock replacement that’s subpar or not secure. However, this focus doesn’t take away from the fact that providing a quick service is at the forefront of everything we do. We understand that lock replacements are often crucial and therefore we complete all tasks to a strict deadline. From the moment you contact us, you know what we’re doing and when we’ll be finished. Not only does this allow you to plan, but it keeps you in the loop. We have a wide range of lock replacement options at Access Denied, which means we’re able to offer something for everyone. Whether you’re in need of a brand new car lock or a heavy duty lock for a business, we have a lot of choices. So, we’re always able to provide exactly what you need. To find out more about lock replacement in Hertford, speak to a member of the Access Denied team. You’ve probably never considered the possibility of a key snapping. After all, they’re strong and durable. This is where a lot of people go wrong. Just because a key is strong and durable, doesn’t mean it’s completely safe against damage. In fact, a lot of people find themselves stuck when their car key or house key snaps. Luckily, at Access Denied, we can help out if you’re key snapped in Hertford. As professional locksmiths, we provide a wide range of services throughout Hertford and the surrounding areas. Though many other locksmiths focus on one area of the industry, we don’t. Instead, we work hard to ensure we’re able to provide the full range of locksmith services to our customers. This means we’re able to assist with cars, homes and businesses. By not limiting ourselves, you’re able to rely on us for everything. Whenever you need a locksmith, you can count on us. This saves you the hassle of having to find another trusted locksmith. Simply, contact the team at Access Denied. This full range of services includes helping out with snapped keys. If you find yourself with a snapped key, it won’t be long before you realise just how much of a stressful situation this can cause. A snapped car key means you’re unable to drive anywhere and a snapped house key means you’re unable to get home, both of which can put a day into chaos. However, help is never too far away. Access Denied can help out at a moment’s notice. When it comes to finding a locksmith in Hertford, you can rely on Access Denied. With an unmatched service and a passion for professionalism, you are guaranteed a service that goes far beyond your expectations. Whether it’s sorting out a snapped key or helping out when you’re locked out, we can help. For more information on finding a locksmith in Hertford or for help with any of our services, get in touch. Contact us today on 7534 277020 for a no obligation quote or for more information on any of our services. Alternatively, get in touch online. Locked keys in car Hertford? This is not a problem and is the most common reason we get calls. Our non-destructive methods of entry mean we can open your car in no time at all. Call us now for a call out in as little as 30 minutes by one of our Hertford Locksmiths. 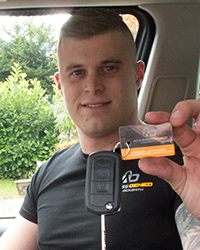 Access Denied Hertford Auto Locksmiths can provide new keys for your car created to the highest of standards again within as little as 30 minutes. Our fully trained team are 24 hour emergency auto locksmiths so you can get to us when you need to. Our Hertford Auto Locksmiths will always be prompt and professional regardless of the time of day that you call on them.